John Lavery. David Richmond (1843–1908), City Treasurer of Glasgow (1887–1890) (sketch), photo credit: Glasgow Museums. Distributed under a CC BY-NC-ND licence. 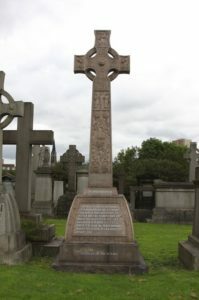 A stone in compartment Zeta commemorates one of Glasgow’s Lord Provosts, , his wife Bethia Shanks, his son Alexander and his sister in law Margaret Shanks. THE late Sir David Richmond, managing director of the firm of David Richmond & Company, Ltd., iron tube manufacturers in Rose Street, Hutchesontown, and Govan, was born at the village of Deanston, near Doune, 14th July, 1843, was educated at Glasgow High School, Athenaeum, and Mechanics’ Institute, and spent three years, on account of delicate health, in Australia and New Zealand. He returned to Glasgow in 1867, however, and began tube manufacture and brass-founding. He was also latterly chairman of the Broxburn Oil Company and the Clyde Valley Electrical Power Company, and a director of Messrs. Henry Widnell & Stewart, John Gray & Co., the local board of the Scottish Union and National Insurance Company, the Tharsis Sulphur and Copper Company, and the United Collieries. Sir David first entered Glasgow Town Council in 1870 as a representative of the old 14th ward, and he remained associated with the same constituency till his retiral in 1899. 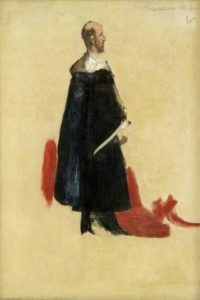 He was a bailie from 1882 to 1886, in which year he was senior magistrate. Among other offices he was Convener of the Parliamentary Bills Committee for a number of years, and from 1887 to 1890 he was City Treasurer. He was the first Lord Provost after the rearrangement of the municipal wards, and the re-election of the whole Town Council in 1896 consequent on the recent vast extension of the city. During his term of office, Queen Victoria celebrated her Diamond Jubilee and Mr. Gladstone died. To commemorate the former event, Sir David proposed the reconstruction of the Royal Infirmary, and for that purpose, before he retired, £86,000 had been raised; and as a memorial to Mr. Gladstone, at a meeting convened by the Lord Provost, it was determined to erect the statue now in George Square, for which £4,000 was subscribed. Sir David was also called upon to collect and transmit £57,983 for the relief of the famine in India in 1807; and £3,633 as the citizens’ contribution towards the Gordon College at Khartoum, advocated by the Sirdar of Egypt, Lord Kitchener. Sir David had also the honourable task of entertaining the Duke and Duchess of York, when they visited the city in 1897 to name the Princes Dock and lay the memorial stone of the Fine art Galleries at Kelvingrove. In 1898 the Convention of Royal, Parliamentary, and Police Burghs met in Glasgow contrary to its previous custom, and Sir David was appointed Chairman. In the same year the union of the old City and Barony Parishes took place, and the Lord Provost acted as returning officer at the election of the new combined Parish Council. He also, in 1876 and 1899, respectively, opened Tollcross Park and Richmond Park, to the latter of which he was asked by the Corporation to allow his name to be attached. Under his reign the Corporation decided to adopt the over head electric system for the street cars, and arrangements were made for the great Glasgow International Exhibition of 1901, while Lady Richmond formally opened the new Glasgow Bridge across the Clyde. In recognition of his many services the Lord Provost received the honour of knighthood from Queen Victoria in 1899. A further testimony to his ability and fairness was given more recently, when on the appointment by Government of a Commission to enquire into the condition of hospitals at the seat of the Boer War, regarding which damaging allegations had been made by Mr. Burdett-Coutts, M.P., Sir David Richmond was one of the three sent out. He was also appointed a member of the extraordinary panel under the Local Government Act to consider Scottish applications for Provisional Orders; and on the retiral of Sir Nathaniel Dunlop in 1907 he was elected Chairman of the Clyde Trust. Sir David died at his residence in Pollokshields on 15th January, 1908. Please contact chair@glasgownecropolis.org or research@glasgownecropolis.org for more information or if you have information/photographs to offer.